Senior North Korean and U.S. officials may meet in Washington, D.C. later this week for consultations on a second summit, a diplomatic source in Seoul said Tuesday. Secretary of State Mike Pompeo is expected to greet Kim Yong-chol, a top aide to North Korean leader Kim Jong-un. The source pointed out that the two sides are resolved to have face-to-face negotiations. "Given Secretary Pompeo's other commitments, it's true that (he's) available for the talks on Jan. 17-18," the source said. Pompeo has cut short a trip to the Middle East for a family funeral. He is likely to attend the Global Chiefs of Mission Conference, to open in Washington on Wednesday, as well. CNN said President Donald Trump has sent a personal letter to the North's leader. It added his envoy may visit Washington as early as this week. 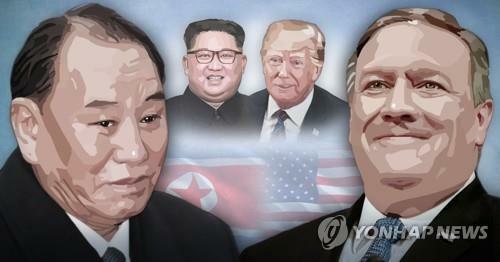 A Seoul-based newspaper, the Chosun Ilbo, also reported Tuesday that Kim Yong-chol will likely travel to the U.S. capital for a two-day trip starting Thursday. There has been no related announcement yet by either Pyongyang or Washington. South Korea's foreign ministry said that there has been diplomatic contact between Washington and Pyongyang regarding their high-level talks, but it is inappropriate to comment on it. "When the date and venue for the follow-up negotiations between the North and U.S. are fixed, there will be a public announcement on that," Noh Kyu-duk, the ministry's spokesman, said during a regular press briefing. Trump has talked openly about progress in efforts to arrange another meeting with the North's leader. U.S. media have cited Vietnam and Thailand as candidate venues, but there is a possibility that the truce village of Panmunjom along the inter-Korean border will be picked. Pompeo was supposed to hold a meeting with Kim, vice chairman of the ruling Workers' Party Central Committee, in New York in November, but it was abruptly canceled. Speculation has been raised in Seoul that the Trump administration might have moved the goal post or lowered its expectations in its bargaining with Pyongyang. Trump said his administration won't rush to make a deal. In a recent Fox News interview, Pompeo said, "We're moving forward in these conversations -- lots of ideas about how we might continue to decrease the risk to the American people." He added, "Reducing the threat from North Korea, whether that's by our success to date in stopping their missile testing, stopping their nuclear testing -- those are the important elements." Some South Korean news outlets construed the remarks as suggesting a shift of Washington's focus toward the elimination of Pyongyang's intercontinental ballistic missiles (ICBMs) away from complete denuclearization, apparently a more difficult aim. Meanwhile, Choe Son-hui, North Korea's vice foreign minister, arrived at an airport in Beijing on Tuesday. Asked about her destination, Choe answered, "I am going to an international conference in Sweden." A South Korean foreign ministry official told reporters there is nothing to share about the visit for now. The official also said that Seoul and Washington are in talks to hold a video conference of their "working group" this week. The group was launched late last year to coordinate the allies' approaches on Pyongyang's denuclearization, sanctions enforcement and inter-Korean cooperation. But the latest session may not be related to the highly anticipated North-U.S. talks, the official added.